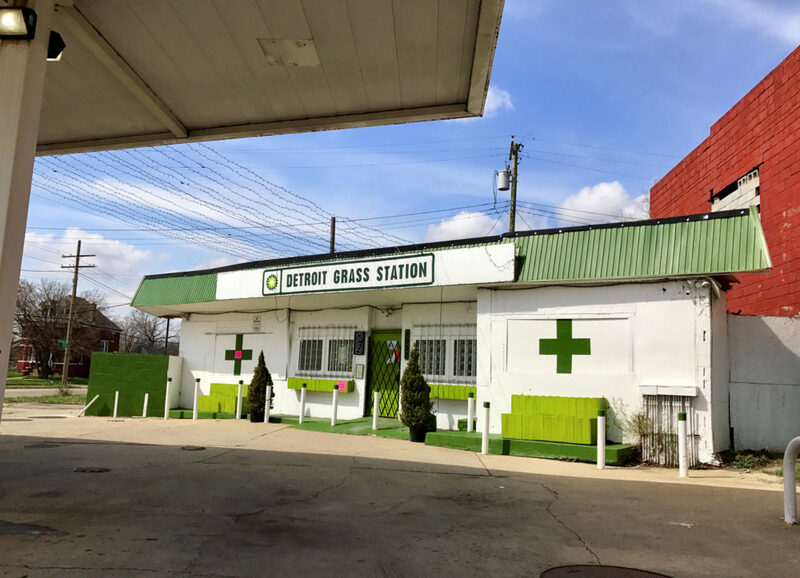 The popular Detroit Grass Station in New Center was forced to closed. Photo by Steve Neavling. Only three of the more than 280 marijuana dispensaries that applied to operate in Detroit have been approved since the city adopted an ordinance restricting the locations of cannabis shops in late 2015. The city has ordered 160 dispensaries to close for violating the ordinance, which generally prohibits shops from opening within 1,000 feet of a liquor store, park, church, school, library, arcade or daycare center. Snoop Dogg OG from a now-closed Detroit dispensary. But that doesn’t mean medical cardholders will have trouble finding a dispensary, at least not for now. Of the dispensaries ordered to close, many remain open because they are appealing the city’s rejection of their applications. An additional 61 cannabis shops are allowed to operate now until the city decides on their applications. And another 61 applicants are hoping to get approval to open new dispensaries. More than 120 applicants are still waiting for a decision by the Board of Zoning Appeals, which has the discretion and authority to approve dispensaries that are almost outside of the restricted areas. So far, the board has shown very little flexibility, raising questions about the accuracy of the city’s estimate that about 50 dispensaries would gain approval to operate. When the crackdown began a year ago this month, the city estimated as many as 85 dispensaries would receive permission to operate. The city now offers an interactive map that shows the status of every applicant, but it’s slightly misleading because many of the dispensaries marked as “Closed by Order” are still open, largely because they’re appealing the city’s decision to circuit court. But the city said today that dispensaries ordered to close must remain closed, even if they are appealing. City inspectors plan this week to identify dispensaries that have remained open after receiving an order to close, said Mayor Duggan spokesman John Roach. Here are the three city-approved dispensaries so far: Green Genie Inc. at 24600 W. McNichols, Caregivers of Detroit at 3340 8 Mile, and The Reef at 6640 8 Mile. When the ordinance went into effect in March, city officials estimated as many as 85 dispensaries would be approved. But according to a Motor City Muckraker analysis of public records, only 22 dispensaries are in permissible areas because – let’s face it – there are a lot of liquor stores and churches in Detroit. Take the Green Pharm, once one of the city’s most reputable dispensaries on Gratiot. It was ordered to close because the building is within 1,000 feet of 14 churches and one liquor store, according to city property data. Michigan voters approved the medical marijuana law in 2008, and dispensaries have been opening in Detroit since. Many opened in formerly vacant commercial buildings and spent significant money sprucing up their businesses. But some residents began complaining about the proliferation of dispensaries and their proximity to schools and parks. In April 2016, the city began reviewing more than 280 applications. To date, the city has made a decision on 165 of them. Most of the dispensary applicants are near the border of other communities, hoping to draw traffic from cities that prohibit cannabis shops. Dispensary owners say the new ordinance is overly restrictive and will harm patients who count on readily accessible, high-quality medicine. The closure of more than 160 dispensaries also is going to contribute to the blight and abandonment in a city that is struggling to attract small businesses. City officials defended the ordinance as a way to regulate a sensible number of dispensaries. Unlike most Michigan cities, Detroit is taking a softer, more tolerant approach to dispensaries. Instead of raiding dispensaries, like they had in the past, police are teaming up with city building officials to advise ineligible dispensaries to close. If they don’t, the city will file a nuisance abatement action. Here’s a map we created showing all of the applicants and the 22 that are within permitted areas, according to our analysis.